The Longère of Lucie shelters 2 charming lodgings (The Barn and the Bread oven) in a farmhouse of the 18th typical Touraine and in the heart of a raised park of 5000m2. The cottage La Grange proposed here is ideal for 2 people but can accommodate up to 4 people thanks to a sofa bed. Our cozy and warm cottage awaits you! Shower room with shower, washbasin (hair dryer at your disposal), WC. Garden furniture with parasol and barbecue. The bread oven, up to 8 people in pure and cozy tones in a rustic chic atmosphere. Possibility to rent our 2 cottages for 12 people with preferential rates. Bathroom Sink leaked innundating all our things in the cabinet. Way too isolated from everything-- 10 miles to nearest groceries. I'm so sad to read your comment about my cottage ! About the leak, you should have warned me, I could have done the necessary !! For your next travels, you should indicate very specific criteria like downtown or shops on foot to not to be disappointed! It's too bad that it doesn't appear and that only the negative caught your attention ! As gite newbies, and seeking somewhere for a stopover en route to Bordeaux with car and two bikes, we thought this fitted the bill after checking that we would be able to keep the bikes somewhere safe. We ended up booking three nights so as to have an opportunity to get a first taste of the Loire Valley for a possible future holiday. In fact the stay exceeded our expectations in so many ways, and we may well return to this very place one day. Our compact gite was perfect for a couple, consisting of an open plan living area with a separate bedroom and a spacious en-suite shower room, all very nicely done. 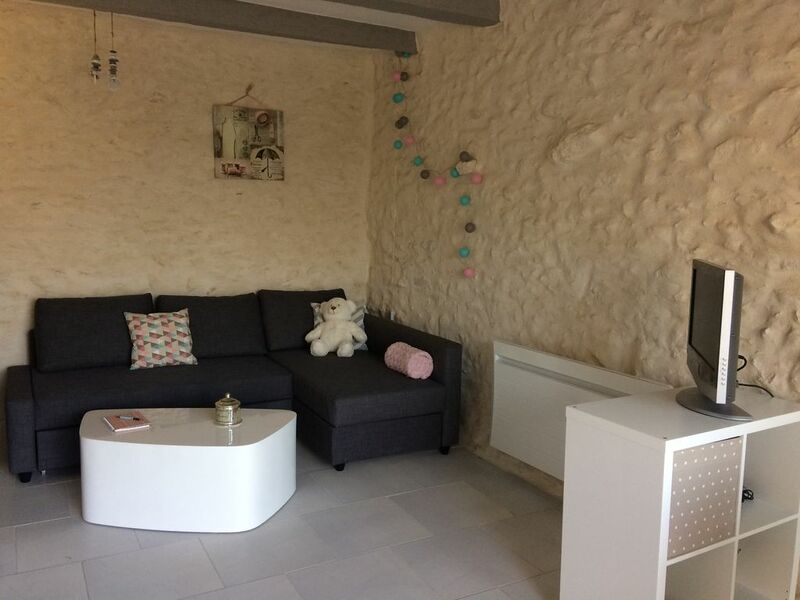 The gite can accommodate an extra two in the living room but it is really meant for two. There is a table and chairs outside and you can help yourself to a barbecue. There is also a laundry room adjoining, where games and tourist information can be found. This facility is shared with a second, larger gite with three bedrooms and sleeping up to 10 (four in bunk beds). For a larger group, renting both gites seemed a very enticing prospect. The gites have use of the owners' spacious, attractive and completely enclosed gardens, in which several play facilities have also been laid on. We visited Villandry (famous for its kitchen garden) and Clos de Lucé, the house where Leonardo da Vinci spent his final years, and spent a lovely day cycling along the Loire, where cyclists are really well catered for. So all in all, much more than a mere stopover, with Lucie's gite providing a perfect venue for our short stay, but in which we could happily have spent several more days. Everything we needed was provided, a bubbly treat awaited us on arrival, and the double bed was very comfortable. Thank you very much Steven for this comment very complete and so nice !!! Well equipped gite with friendly host. Gîte à la fois au calme et proche de nombreux châteaux de la Loire. Le gîte est en conformité avec sa description dans l'annonce. Situé dans un grand jardin commun (maison du propriétaire+1 autre gîte), l'accès est sécurisé par un portail électrique. Très bien aménagé et très propre. Lucie est au petit soin pour ses hôtes. Nous avons fort apprécié notre séjour. Bon à savoir... faire ses courses avant car magasins à 10km. Trés bon accueil. Super gîte. Déco tout à fait à notre goût. Calme, espace... delicieuses petites attention. ..
Chère Christine, merci pour ce très gentil commentaire, c’était un vrai plaisir de vous accueillir et j’espère vous recevoir de nouveau lors d’un prochain séjour en Touraine ! Discover the castle of Chenonceau at 10 minutes, Amboise at 20 minutes, the Donjon of Loches, medieval town at 20 km or Domaine de Chambord at 70 km. Stroll through the gardens of Villandry, Chaumont / Loire and Valmer. Take the circuits of the Loire and Cher by bike. Le Clos Lucé in Amboise, the last home of Leonardo da Vinci, and the incredible machines of this true genius in model but also life size in the immense garden. The Family Park in Saint Martin le Beau for a day of games, entertainment and fun with inflatable structures, fun fair, acrobatic trails, water games, circus shows or even pony rides. The little train of the Reserve de Beaumarchais in Autrèche to meet Doudou, the dominant deer of the herd present on the park, the curious wild boars, the majestic ostriches or even the legendary bison. The Zoo of Beauvalà Saint-Aignan with the African Savannah, the tropical greenhouse, the Asian plain with the two pandas stars of the Zoo, Yuan Zi and Huan Huan, or the many shows and animal feedings.